This style pouch CB-OL shown here in this picture can be made in any size required. This pouch is 7 inches wide by 11 inches high. 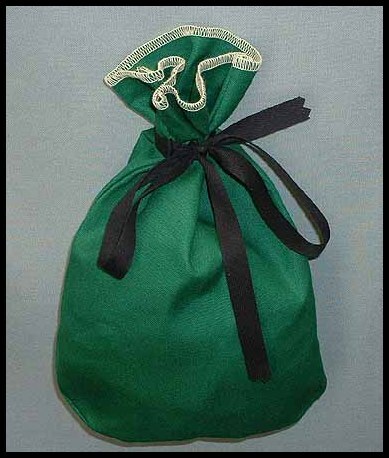 We can alter the size of this or any pouch or bag to the size that you request. This is a more economical style being that the top edge is finished with an overlock/sreger machine. The top thread in this picture is white only for visibility reasons in this photo. A finished bag would have matching thread. This style pouch is designed more for storing items. It has an old-fashioned tie closure, which is very reliable! No snaps to break or velcro to wear out. Closure ties are long enough so you can tie a bow for easy access. This style pouch can be made in any of our stock fabric colors.